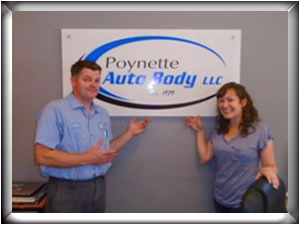 It is your car and it is your choice where you get your estimate AND where you get your vehicle repaired. Only exception is if this states otherwise in your policy. Your insurance company might try to persuade you to go to one of their select shops, but legally you have the right to go where you choose. Statute 632.375 states your insurance company cannot legally direct you to a specific auto collision repair shop. Though our estimates are free, they are a priceless tool in your car repair decision-making process. An appointment is not necessary, unless that best suits your schedule. We are open Monday through Friday, 7:30am – 5:00pm, closing noon-1:00pm for lunch. Allow for about 20 minutes as we gather information, take photos per insurance requirements and write up an estimate. When you walk out the door, you will have an estimate in hand or we can email one to you and your insurance company. If you find your hours and our hours don’t jive for getting an estimate, we will find a solution to get it done.